Statue of Nadirshaw Edulji Dinshaw. This is the story of a Parsi father and his son; their services for the city of Karachi long forgotten by the non-Parsi community of the city or the country. The father was Edulji Dinshaw, and the son Nadirshaw Edulji Dinshaw. The city today has hospitals, educational institutes and residential colonies that are products of their tireless, selfless efforts for the development of this metropolis. According to F.K. Dada Chalji, the only thing Karachi gave the Dinshaws in exchange for their favours were statues. They could be seen standing tall in various parts of the city. Dada doesn’t tell where to find these statues. Before the Partition of 1947, the city had a number of these statues in memory of the people who had served it. After independence though, the statues in Pakistan started disappearing. The list of disappeared statues includes those of M. K. Gandhi and Jawaharlal Nehru. We will come to the subject of the locations of the statues of the Dinshaws, but first, let's talk about the more the important bits. A hundred and thirty years ago, Dinshaw was the first individual in Karachi to have established no less than 12 hospitals for the people's welfare. In 1885, the Vicerine of India, Lady Dufferin (wife of Frederick Hamilton-Temple-Blackwood, Viceroy of India from 1884-1888), announced the Countess of the Dufferin Fund which was meant to provide medical services to women in different parts of India. The Raj asked Sindh for donations for the fund and the entire Sindh donated a total of Rs 10,000. The Dufferin Fund committee itself donated Rs. 5,000 rupees. The sum was not sufficient to build a hospital at the time, leaving the project uninitiated for more than half a decade. In 1894, Edulji Dinshaw donated Rs. 50,000 to the fund, making the initiation possible. During the construction, certain changes in the design caused the cost to jump up a bit and Dinshaw voluntarily provided for it all. Not only this, Dinshaw also bought the hospital's first consignment of medicinal supplies, while his son Nadirshaw donated furniture for it. In the end, compared to the total donation by the committee and the province, amounting to a mere Rs. 15,000, the Dinshaws donated Rs. 85,000. That is what Dada Chalji calls in his book the ‘Zartashi jigra’ (Zoroastrian spirit). Apart from the Dufferin fund hospital, the Dinshaws also helped set up two missionary hospitals in the city. The dispensary set up in 1882 by Edulji Dinshaw near Empress Market in Karachi. Edulji Dinshaw was also an educationist. He would donate hundreds of thousands of rupees to the Bombay University in order to financially support students in need. The Mama Parsi School in Karachi and the Sardar Dastoor Girls School in Pune (India) are examples of their efforts towards education. The most noteworthy example is the engineering institute in Karachi that many aspiring engineers dream to get a slot in – the NED University of Engineering and Technology; it is among the top engineering universities in Pakistan. Almost every educated Pakistani knows about the institute and honours its reputation, but not everyone knows that NED stands for Nadirshaw Edulji Dinshaw. I was not able to find the two statues Dada Chalji mentions – sadly, the only thing Pakistan did give back to the Dinshaws is now untraceable. However, when I saw Soomro the next day, he was kind enough to share his experience of the lecture. He must have gone on, but I stopped listening after the word ‘statue’. I had to see it with my own eyes, I had decided. The Parsi Institute is located on the route which takes you from Lines Area to Saddar. While the building is somewhat nondescript, it does have a spacious lawn and to the right, I could see a statue. I neared it and beheld Mr Edulji Dinshaw carved in stone. I was relieved to see it intact. Standing there, I paid my respects. Almost a week later, I was passing by the road leading to the Parsi Institute and noticed a festive commotion at the institute. I could see a number of cameras rolling, so I asked a man what was going on and he told me someone was filming. My photojournalist friend Akbar Baloch was keen enough to point out to me that I had missed a whole other statue, that of Nadirshaw Dinshaw. The Dinshaws’ statues were removed from their original location to the institute without any damage. This was a pleasant surprise for me, because the statue of Harchand Rai Vishandas had lost his head in the process, while that of Queen Victoria lost its limbs and nose. 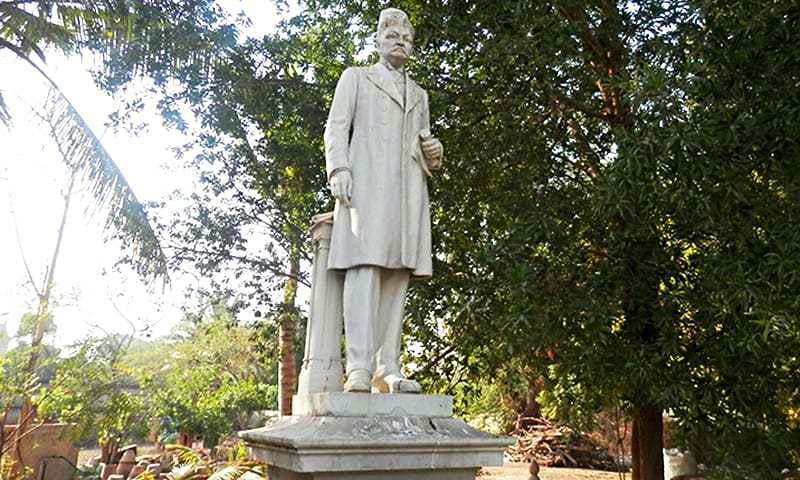 How and why the statues ended up at the institute, only a Parsi would probably know. Sadly, there are not many left in Karachi and those who are here may not want to talk about it. The plaques on these statues give some information on their original locations. Edulji Dinshaw once stood on what was once Victoria Road. The spot near Metropole Hotel where the statue of Nadirshaw Dinshaw once stood. Victoria Road is now known as Abdullah Haroon Road and Nadirshaw Dinshaw’s spot has been replaced by a clock tower. The Bonus Road became the Fatima Jinnah Road long ago. The purity of the land of the pure does not allow the impure practice of erecting statues in the country. Nevertheless, would it be too much to name at least the two intersections after the great father-son duo who contributed so much to this land and have their services acknowledged in some form? —All photos are by the author and taken with permission of the Parsi Institute. Translation by Aadarsh from the original in Urdu here. A very interesting and informative article. I wish the statutes could be placed back at the original site, to honor the contributions of the two founding fathers to Karachi. Thanks to Dinshaw family for doing so much for Karachi. Yes there should be few roads on their names. Do we have roads in Karachi with Sattar Edi's name or Prof Abdul salam's name??? Thank you for your article. We as the people of Karachi and Pakistan owe so many such people a great debt. The important point is vital for the youth especially as well as older generations is the service done by this generation was for the whole community especially the most needy regardless of creed and caste. A nation which does not respect its past, has no future. The university is already known after him. That is tribute enough. Hats off to Nadirshah family. Really did great service to Karachi. Thanks Mr. Balouch for all your history searching articles. MK Gandhi & Jawahar Lal Nehru were two very significant sociopolitical personalities of the 20th century who were totally committed freedom fighters of the sub continent. They were instrumental in ending British rule not only in the larger erstwhile India that included the present nation of Pakistan. This fact has been recognised by eminent historians and evidenced by others who were their associates and contemporaries including Quaid. It is about time our present leaders recognised this fact and honoured these two great human beings although India of today claims them as they remained in India post partition. Perhaps a statue of each in Lahore or Karachi if not the Islamabad? London has two statues of M K Gandhi, one at Parliament Square and one in Tavistock Square. Now, if adversaries of the time the British could honour him why not us? After all he fought for our freedom. Thanks a lot for the article. I am immensely informed of the great philanthropists of our past who made the life of common man bearable. It is unfortunate that this tribe and trait is now absent in these days of modern business ethics. That is our greatest loss. Great research Mr. Akhtar, Dinshaw family and their Great work for Karachi is remarkable. Thousands of Karachi people and ultimately Pakistani people benefited by this family and their projects. They were great philanthropist. NED University is one of the example. Thousands of engineers respect the founder of this remarkable institution. Thank you Mr. Dinshaw, we respect you and respect you for ever. The Zoroastrians were driven out of their lands so they went as refugees to India, an overpopulated country that that for centuries before and later welcomed travelers. We can understand that the Zoroastrians had tremendous gratitude to the country that gave them refuge. With their enterprise they not only built a name for themselves but it was their charity that remains unparalleled in human history. While Pakistan is fortunate to receive some of their generosity, India was the country that reaped maximum benefits. Institutions set up by them in the fields of Education, Healthcare, Science, Banking, Industry, Art and Culture have a towering presence. Till today the promise made that they will not convert people remains, even though the community faces extinction. they taught the world an important lesson -- it is not quantity but quality that counts and practice what you preach. Is it only me who is feeling some sort of pain in the heart after reading what we did with our heroes? Why does anyone working for Human Rights organizations always try to glorify India in all their articles? This article would still be a good read if there was no mention of Gandhi and Nehru statues. India does not have a Jinnah statue. Some how the landlords of Sindh, The Syeds, Shahs are all missing from the list. I don't think its too much. With some lobbying by people like you with the proper authorities, I hope the two intersections can be named after them. @Akhtar Balouch: Many Thanks. I am big fan of yours. As usual, you did a marvelous job. You are distinguish historian. Thank you for this article Akhter Baloch. Especially the narration about the NED university founded by Nadirshaw Edulji Dinshaw deeply moved my heart since I have studied in the esteemed institution, however, to my disappointment and others like me, we had not been for a single occasion told about the founder of this institution. NED was found in the last year of Mr. NED's life in 1922 as NED college. One can conceive how much pains he would have taken to materialize his idea of building the college which has been a loving memory of my life and once again a dream of my son. I on behalf of all NEDians strongly demand the government to do something in praise of the great gentleman. The most appropriate way is to include a chapter in the Pakistan Studies syllabus of NED first year in order to make every student know him and respect him. And you guys were complaining about changing Aurangjeb Road in new Delhi. Hi dawn Mumbai and Karachi was twin city at that time. At that time Karachi was more powerful than that of Mumbai in trade and investment business. Parsi people's have been contributed lot in development of both city's . Unfortunately Karachi lost his rhythm due to violence at 90s same happned about Mumbai. But here Mumbai dominated at Karachi becoz Mumbai handlled very well since 93.But Karachi become victim of Pakistani politicians corruption Lahore love . And Slowly slowly Karachi lost his richness and become crime adda. But about Mumbai central government and state governments planned very well to develop Mumbai. And Mumbai developed along with India also developed. Development of Pakistan is totally hijacked due to undevlopment of Karachi. So develop Karachi first no need to develop Pakistan it will happen automatically. What a lovely piece! There is so much of history in all our cities that we're neglecting after the independence. Be it Bombay or Karachi, the story is the same. And that is such a shame. Your piece reminds me of Cowasji Jehangir Readymoney, who, again was a Parsi philanthropist who did much for Bombay and is now almost forgotten. Again, lovely article Mr. Balouch. Thoroughly enjoyed reading it. These Parsi philanthropists did great things, but how about current heroes, like Edhi? Shouldn't there be statues for such people? The point is that tastes change and one shouldn't live in the past. For some reason, the recurrent theme in the author's articles is the culture that existed about 70 years ago (pre-partition). Cultures come and go, only principles and values remain. The names and statues of the true heroes of Karachi are removed and are replaced by names who having nothing to do with the history of Karachi. One such example is Jaffer Faddoo Dispensary building with the clock tower located on Agha Khan Road, formerly Harris Road, Kharadhar, Karachi. Jaffer Faddoo, my great grandfather, built this dispensary in 1904 with his own money and donated to KMC which provided services to the poor of Karachi. After establishment of Pakistan and with the rampant corruption the building was handed over to the Memon Assocuiation, whose first act was to demolish the whole building. It was due to the great effort of Dr. Sherbanoo, grand daughter of Jaffer Faddoo that the tower was preserved and was promised that his Photo will be displaced in the entrance lobby. The Memon Association however reengaged on the agreement and has removed his picture. This is how our heroes are treated. @Imran Mumbai India still preserve Mohammad Ali Jinnah Hall. @ Noman Ahmed Strachen Road should have been named Nadirshaw Edulji Dinshaw Road. Therefore the writer is right. Moreover there are very few Parsis in the country and they are very peaceful! What a shame we have forgotten about the people who gave so much to the city. Interesting article though after reading it seems that these gentlemen founded Mama Parsi School and NED University - which is not correct. The Mama Parsi School was founded by Mr. Hormusji Mama who contributed Rs. 300,000/- for its founding, hence the use of the name, "Mama" He also owned the house which later became "The Palace Hotel." I do not know how much, if any the Dinshaw family contributed to it, but his was the largest contribution. Secondly, NED University was not founded by Mr. N.E. Dinshaw. It was founded by the citizens of Karachi in 1922 and named Prince of Wales Engineering College, after the Prince of Wales (later King Edward VIII) who visited the city in 1921. Mr. N. E. Dinshaw's family donated a large amount of money in 1924 and hence the change in name. Also 4 seats were reserved for Parsi students, a tradition continued to this day though now these are given to other deserving students. Parsi's have performed great service for Pakistan. For that they should be thanked and respected. @Feroz There are numerous streets in Mumbai named after great Parsis!!!!! Remember that Mumbai has always been and still under the absolute control right wing Hindu nationalist partuies like the Shiv Sena and the BJP both of whom hold the Parsis in extremely high regard!!!!!!! @Rashid Sultan. Wonderful letter, and a timely reminder. Nations that honor brave, selfless, courageous people are great Nations, like Great Britain. Pakistan indeed should honor without a doubt MK Gandhi, and Jawahar Lal Nehru. Perhaps roads, should be named after these two great men of the Sub-Continent. Statues are unthinkable in this country. 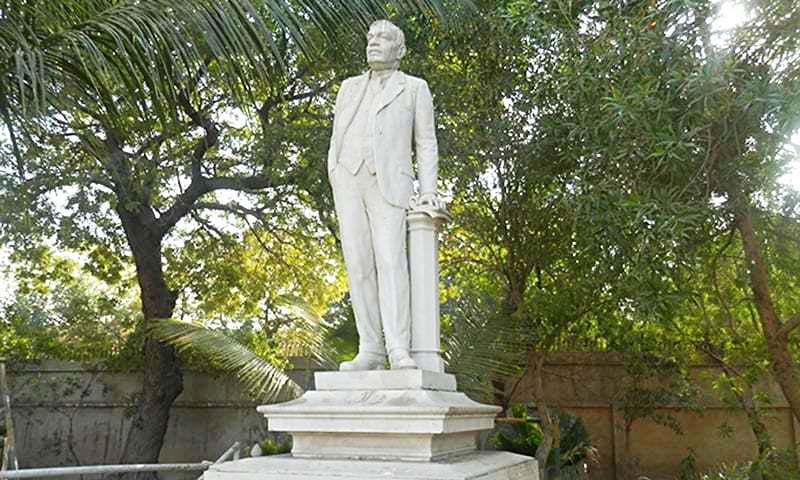 The statues of Edulji Dinshaw and son Nadirshaw, is located in the Karachi Parsi Institute, i.e. not a very public place. We in Pakistan have to learn our social history, our geographical history, our human history, our cultural history, to know who we really are. We have to know all our heroes from the sub-continent, that would be a mind opener. @ Noman Ahmed. Always a pleasure to read your well informed, articles. @Sarwar, USA they came much later!! Its not true that the only thing Karachi gave were statues - there is a road named after Seth Eduljee Dinshaw - it runs from KPT Building to Old Customs House - earlier this year a project was initiated to restore it. The son lived only 8 years after his father's death !! Imagine if we could have a luxury cruise between Karachi to Mumbai one day !! If I am not wrong the road on which both the KPT Building and the Customs House stand is named after Eduljee Dinshaw. On the issue of statues to honor our city fathers and the fact that they add grace to the city....apparently its a touchy subject because some feel it infringes on religious sensibilities of people. @Shah Sahab The Statues should replaced with new heroes who participated in the war against British to win freedom from imperialists . Though it is very difficult task to find few of them in Pakistan as most of the battles were fought far away from this area , still it may be well worth to even have one of them honored. @Naved We the thankless people have no hat left on our heads. If you have liked this article, please read " The lost Parsis of Pindi" by the same gentleman Mr.Akhtar Balouch and appeared in Dawn.com sometime back. Being a history buff, I have always reading Mr. Baloch's articles in these pages. Both Pakistan and India owe a great debt to the Parsis whose philathropy has helped these two nations. @Rashid Sultan They fought for the Independence of India and did everything with in their power to prevent Pakistan and today you must appreciate the importance of Pakistan for the muslims or if you need reality check then look at Kashmiris where they could not even celebrate eid ul Adha they way we do it in Pakistan!!!!! one of the many blessings of having your own country!!!!! i am not a big ,rich or famous person, but everything that i am , i owe to the help and encouragement from my PARSI employers. They are great people. Very enlightened personalities. Pakistanis especially of Karachi "Sindh" owe their gratitude to these Parsis who have done so much to help humanity at large. The minimum they deserve is a mention in the history books of Primary and Secondary students. Their statues must be placed at proper locations to acknowledge the role this community played and the lasting contribution in the field of health and education they made. Being NEdian i feel proud of both the son and father. your tireless efforts for the karachi are remarkable. @RZ much informative correction apart from its authenticity. After reading I was ashamed of my ignorance. I grew up in Pakistan and never heard of such great human beings. This shows how tainted the history of Pakistan is. The real heroes are totally forgotten. Proud to be an NEDian. Even my two elders brothers were the students of "NED" but they never know the name of him. why we forget these ppl because we dont love our history . Akthar Balouch always writes very good historical articles and another good one...if these wise writers will continue doing these memory based articles the time will come back in future when the people of Pakistan will come back to its roots and rebuild from there.and remember their heroes Inshahallah. "It's lamentable" how the "philanthropists" are "eroded from the history of Pakistan" What will our "new generations" think of the past? there will be "no past" to remember by. We need to have a "Hall of fame" for all those who have "given" to Pakistan and introduce this into the educational establishments, irrespective of ones religion race or creed. Great article! @Imran If you don't know, there is "Jinnah House" in Mumbai that's quite well being taken care by the Indian government. As someone stated above " you have no future if you cannot respect your past, that is, history". Amazing article. Al though I am a pathan from KPK but I really like and admire the Parsi community. The ones in Karachi have been doing a lot of good work and they were highly educated people with good hearts, they learnt many good things from the British which unfortunately many of us did not. It's very sad that the land of the pure doesn't have room for such pureness. for speculations are ,... he might have actually Landed some where near Port Qasim ...not Mai Kolachi Jo goth . A good article. The statues of Eduljee & Nadirshaw Dinshaws were removed from the prominent roundabouts of Karachi by Parsi Coommunity elders and placed in the KPI in the early sixties to protect them from vandals who continued to behead them. A close look will show signs of their repair. The names of Eduljee Dinshaw and Hoshang (his very generous grandson) remain on the roads named after them. The beautiful bronze statue of Ghandi, which adorned the roundabout in front of the High Court, was removed on the request of Mr. Jinnah to avoid its desecration by vandals. It is now in the Indian High Commission in Islamabad. Mr.Nadiirshaw Dinshaw was not the father-in-law of Ardeshir Cowasjee and Jamshed Marker. It was his son Faredoon Dinshaw. thanks Akhtar , the story goes on and on , we have stupid people and stupid rulers it is shame we do nothing and those who have done some thing we brand them and demolish history. there was a building built and named by Nusserwanjee Eduljee Dinshaw in Kharadher,when unfortunately these short sighted people at K.D.A. gave permission to make apartment,luckily that building was taken out brick by brick and erected at Clifton. Mr Balch Thanks for writing such a wonderful article about our benefactors. I am NED graduate and owe success of my life to these gentle souls. God bless them. A bust of Mr.Nadirshaw Eduljee Dinshaw (NED) existed side by side the bust of Mr. Dayaram Jethmal (DJ) inside the entrance hall of main building of DJ Science College - it did at least while I remained a student there during 1969-1971. NED Engineering University may request DJ Science College administration to handover the bust of Mr. NED to it for placement at a prominent place in its new campus on University Road (it is still called the new campus even though the classes had begun there as far back as 1975). Also, a brief of the philanthropist's educational services for Sindh should be recorded on the pedestal of the bust. We must learn to honor our benefactors, irrespective of their caste or creed. By removing the statues, history doesn't change. It's a shame that the country doesn't respect its history as it should. But, then what can you expect from Jihalistan? I remember the Dinshaw family owned a house near Goethe Institut in Karachi and much like the Parsi Colony off M A Jinnah Road, this house maintaned a sense of serenity and peace like that of 19th century Karachi so much so that I could some times take a detour through its driveway which joined two major roads, as a short cut, without being interrupted! Indeed, the KMC Building should have a permanent exhibit on the Parsis of Karachi and their magnificent contributions to this city. Of course, a City Museum of Karachi would have been a more apt place for such an exhibit but that idea, once floated actively under Farooq Sattar's mayorship, seems to have lost its ownership. You put it perfectly. Karachi was indeed set at one time to match Bombay in no small measure to the efforts of Sir Bartle Frere who worked against competing interests to have a port established in Karachi. Had Karachi been allowed to grow naturally and its dynamism not throttled through governmental actions or through artificial attempts to alter its demographics, Karachi would have contined to remain the standard bearer of Pakistan. Unfortunately, the ethnic biases which form suh a key feature of Pakistan's polity have worked successfully to limit Karachi's potential. In line for tribute to Dinshaw,s, what have we done for Abdul Sattar Edhi, Hakim Saeed and many more like them? Since we are paying tribute to Paris community, please don't forget the famous Ardeshir Cowasjee as well. @Rashid Sultan - very sensible comment on Gandhiji and Nehruji statues. @fida Let me add that without this great hero, Karachi would be without NED Engineering College, and I would not have become an engineer without his institution. Thank you Nadirshaw Edulji Dinshaw, my hero. @Parvez What about Tombs and Mausoleums, why they are tolerated? Unfair treatment to the true servers of even Karachiites on the basis of multi-dimensional prejudices — as demonstrated by post-partition self-centred groups — has deprived the taking over generation from several unmatched values and humanitarian services that had been set forth by various great persons. Of such unfair deeds, changing name of Dawood Engineering College is also one. Can one ever find a calibre of Dinshaws, Dawoods, Adamjees, Valikas, Edhis in self-centred persons with a background of selling cinema-tickets and minting money through untold for means? It will be appropriate to install the founder's statue at NED university. The university should also publicize the great work that the two Dinshaws have done for Karachi. @Burjor Rustomji. Thank you. A time will come when we will accept reality and facts. And stop believing in fiction and hearsay as history. @Rashid Sultan That would be a very generous and gracious gesture. @Osman Din Cultures can change but appreciation memory and gratitude for the good men and events of the past should be encouraged. If a rich man today sees the respect accorded to the philanthropists of the past , he might want to do charitable deeds himself/herself. Yes, we should have an intersection named in honor of Dinshaws. Thank you for a truly wonderful article. And my warmest thanks to the Dinshaws and the Parsi community for their selfless service to Karachi and Pakistan. It is such a shame the huge amount of revisionism that has occurred in Pakistan in terms of re-naming countless places that once meant something. It is tantamount to re-writing history. So very many names of people who were honoured for what they contributed to towns, cities (indeed, whole cities), places of learning, medicine etc have been changed, obliterating not just the former name but what it stood for in sociological/historic terms. If there is a need to honour modern-day achievers, then build new places (or let them build news places such as the Parsi father/son) and give it their name. Pakistan has, too often on whim of appeasers and others seeking self-aggrandisement, with the stroke of a pen, obliterated so much of its history. Very sad. i graduated from one of the fines NED University. thankd Dinshaws for the institute. Excellent article! Love Karachi city but the people are very ignorant to the realities, everything is about twisted religion and corrupt politics. If history is any reference, one cannot stop human mobility. But it is sad to read that most Parsis have left Karachi. Nice and well-researched article. Thanks lot. Pakistan has another, equally personal and human connection to the Parsi Community of India and the sub-continent: MA Jinnah's only grandson (and son of his only daughter - Dina Wadia)), Nusli Wadia is a proud Indian, and a successful business tycoon.